On Wednesday the 14th October 2015, at 11h:00 am, at the conference hall of the Istituto di Santa Maria in Aquiro of the Italian Senate there will be the presentation of the book of the Rector, Prof. Maria Amata Garito, "L'università del XXI secolo tra tradizione e innovazione", and of UNINETTUNO’s model. 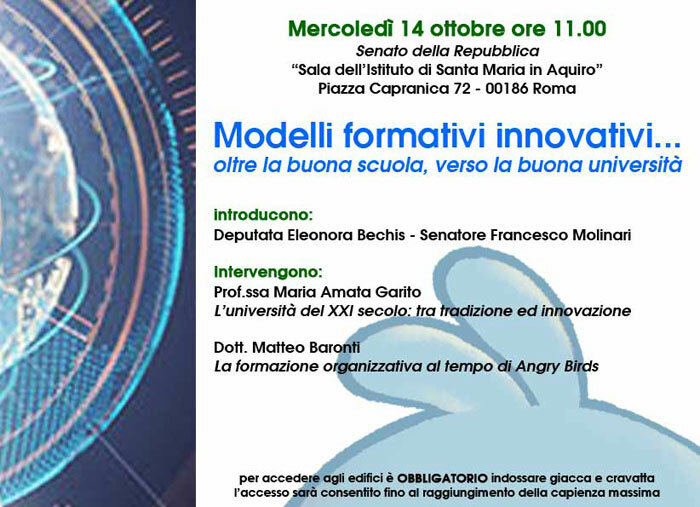 The meeting will deal with innovative educational models and will represent a very good occasion to discuss about the most significant factors of innovation that UNINETTUNO is bringing to the Italian university system. If you wish to attend the meeting please confirm your participation to: info@uninettunouniversity.net.